Right Reverend John is John Edward LaFave. The "right reverend" part is a tongue-in-cheek pen and stage name John has used at various times to various ends. Though John actually was ordained and served as worship and associate pastor with Harvest House Church in Fenton, Michigan, many, many years ago. He also founded Global Mission Alliance a small third world non-profit that did relief work in several countries in the eighties/early nineties. John has retired from "the ministry" but has a hard time burying this "Right Reverend" dude. "stripped down & shaken - the street tapes." The Artist Mind explores biblical spirituality from the perspective of the artist as opposed to the literalist. It is an appeal to the mystic within us all. something we do see and understand ... like a dimension beyond our ability to fathom ... which it is." Parables is a collection of blog postings, random short observations and song lyrics gathered throughout the year 2016 ... a chronicle of the years thoughts so far. "The effectual fervent prayer of a righteous man (or woman) availeth much" (James 5:16). "ENERGEO" explores this and other biblical texts in a penetrating study of the interiors of the art and labor of praying. It is designed to assist those serious in their pursuit of a truly effective praying life. When praying, we are not alone. 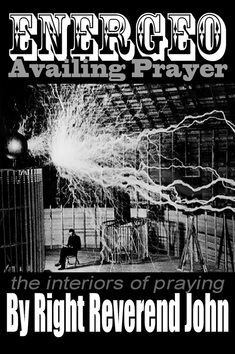 It is more effective as a guide for those doing prayer than it is an easy read for those with a casual interest. This author has benefited from the principles in "ENERGEO" and hopes they will be helpful to each and every reader. Peace. "ENTERING CANAAN/A Call to Battle" is a balanced biblical guide to spiritual warfare written by the author nearly 30 years ago. A biblical examination of a very serious subject. Only for the brave of heart.